A report released today by USDA's Economic Research Service shows that the United States will fall short of its 2007 goal for reducing food insecurity. The report, by ERS sociologist Mark Nord, describes the stark contrast between the department's target for reducing household food insecurity and the actual trends in hardship for low-income Americans. 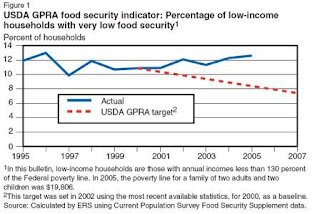 In its Strategic Plan for 2002-2007, USDA adopted as a target a reduction in the rate of "very low food security" -- the measurement concept formerly known as "food insecurity with hunger" -- to 7.4% of low-income Americans. Here below is Figure 1 from the USDA/ERS report. The dashed line shows the hypothetical rate of progress that would have led to success in meeting the target. The blue line shows the actual increase in food insecurity during the period covered by the Strategic Plan. The target in the Strategic Plan was originally motivated by the Government Performance and Results Act -- known in government only by the acronym GPRA and never by its full name -- as a goal for USDA's Food and Nutrition Service, which oversees the Food Stamp Program and other programs. I have long encouraged USDA to report its progress toward these goals bravely, as this report does, rather than letting the goals slip away into history unmet and yet unnoticed (see link and .pdf link). Of course, one can't really blame FNS for the failure illustrated in this figure. In the report, Nord gently points out both that the target was ambitious and that food insecurity is related to a whole array of hardships. These hardships would require a stronger anti-poverty agenda to remedy, and can't be tackled with food assistance alone. The real import of today's report may be to put on the record that by letting that anti-poverty agenda wither away over many years, the U.S. government has essentially made a policy decision to tolerate rising rates of -- and I'll use the no-longer-official word -- hunger. In addition, your use of this slogan also tarnishes the good reputation of the National Pork Board's mark in light of your apparent attempt to promote the use of breastmilk beyond merely for infant consumption, such as with the following slogans on your website in close proximity to the slogan "The Other White Milk." "Dairy Diva," "Nursing, Nature's Own Breast Enhancement," "Eat at Mom's, fast-fresh-from the breast," and "My Milk is the Breast." This letter so offended The Lactivist that she publicized it across the blogosphere and sought assistance from a pro bono lawyer. The controversy brought a good deal of traffic to U.S. Food Policy's earlier reporting on the sale of the Other White Meat slogan. As The Lactivist reported in a later post, the fuss led to a very apologetic letter from Pork Board CEO Steve Murphy, and another letter from Pork Board staff offering to make donations out of their own pocket to an appropriate charitable cause, the Mother's Milk Bank of Ohio. Good for the Pork Board. Now I can only hope no legal trouble will befall the organization for public health students in Massachusetts, whose recent fundraiser (nonprofit, of course!) uses the slogan "Got Leafy Greens?." The organization's Dustin Burnett, a graduate student at Tufts, told me -- as I was buying one for myself -- that they had taken care not to replicate the font or visual design of the federal government's checkoff program for fluid milk, which of course uses the slogan "Got Milk?." Perhaps that will suffice to keep the fluid milk board's lawyers at bay. If you would like to order a "Got Leafy Greens?" t-shirt and support the students, write Dustin at the email address: gotleafygreens@yahoo.com. The Massachusetts Public Health Association is publicizing a hearing on May 30 at 10 am at the Statehouse in Boston about a bill to improve school nutrition. A fact sheet about the bill is available (.pdf). If you care about nutrition policy in Massachusetts, this is the event of the season for you. Ever find yourself in the natural foods section of your grocery store wondering what one would do with amaranth or quinoa? Or have you ever looked for creative ways to incorporate "super foods" into your diet? Heidi lays it all out for us, explaining the foods you should have in your pantry, healthful grains to use in your cooking, the importance of including phytonutrient-rich colorful foods in your meals, and suggestions for super foods and natural sweeteners. 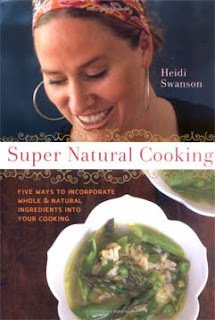 The book includes over 80 recipes, most beautifully photographed by Heidi herself. The transformation of livestock manure from a valuable agricultural input to a pollutant is a great story of economics in action. Once upon a time, when small and mid-sized livestock operations were an important part of mixed farming systems across the country, livestock manure was an essential source of fertilizer for nearby farms. Now, immense factory farms are so concentrated in some counties -- notably in North Carolina in recent years -- that there is not enough cropland to dispose of all the waste that is created. When supplies of manure become large, its value falls and an incentive is created to apply manure at rates exceeding crop requirements or to otherwise dispose of manure as inexpensively as possible, despite negative externalities. Consistent with externality theory, degradation of public resources (air and water) has occurred in regions of the country with high concentrations of livestock. Keplinger and Hauck point out that the ratio of nitrogen to phosphorous required for most crop fertilization exceeds the ratio of nitrogen to phosphorous found in most manure from factory farms. So, when the manure is dumped on fields as a disposal mechanism, the phosphorous becomes a key pollutant. Below is a map from an article by Marc Ribaudo at USDA/ERS of counties where the amount of phosphorous in manure that must be disposed exceeds the entire assimilative capacity of the county's farmland. 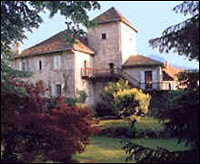 I leave this weekend for a six-week stint as Scholar-in-Residence at the Tufts European Center in Talloires, France, about 45 minutes from Geneva. I will continue writing from afar. 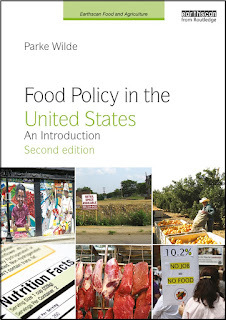 Please leave comments with ideas for U.S. Food Policy topics to cover from a European perspective. ("That shouldn't count as work!" is an editorial comment, not a topic suggestion). A bientot! It can seem impossible for an ordinary parent to improve his or her family's nutrition and physical activity, when every aspect of the outside environment undermines the effort. The Shape Up Somerville program, a collaboration between the Friedman School of Nutrition at Tufts and the nearby city of Somerville, MA, offers an appealing vision of a whole community working together to change that environment. 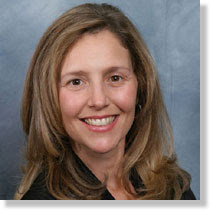 Professor Christina Economos (pictured) and her colleagues quite fearlessly tackled a long list of community issues at the same time, in hopes of creating a critical mass of improvements to create a virtuous cycle of family-based and community-based changes. The Somerville study is believed to be the first controlled experiment demonstrating the value of a community wide effort. It's only a small dent, but slowing the pace of weight gain among kids is the key to conquering childhood obesity, says lead author Christina Economos, an assistant professor at Tufts University. "It could be the difference between graduating overweight and graduating at a normal weight," she says. "We need to think about how it plays out long term." The Somerville program, designed primarily by Dr. Economos and fellow researchers at the Tufts Friedman School of Nutrition, offers a surprising blueprint. It didn't force schoolchildren to go on diets. Instead, the goal was to change their environment with small and inexpensive steps. Dr. Economos, a specialist in pediatric nutrition and the mother of two school-age children, has long believed that the battle against obesity can't be fought at the dinner table alone but requires social and political changes. Motivated by a desire to influence nutrition issues that at first appear to be individual concerns, Economos and her colleagues found themselves deeply involved in policy discussions and even economic debates that they might never have expected at the beginning. One of my favorite stories relates to how their effort to invite active participation by school food service workers required them first to allay the workers' concerns about the labor of processing more fresh vegetables, and that in turn led to a convoluted labor negotiation that ended up working to everybody's satisfaction. Update: A reader points out: "Those famous portraits in the WSJ are stipple drawings. Specifically, they are referred to as 'hedcuts,' though I just learned that today." USDA's Agricultural Marketing Service has agreed to end the dairy weight-loss advertising campaign sponsored by the federal government's fluid milk and dairy checkoff programs, according to a letter that the Federal Trade Commission sent this month to the Physicians Committee for Responsible Medicine. The advertisements have frequently included nutrition science howlers, such as the print ad below, which says, "studies show that people who get enough calcium in their diet weigh less than those who don't." Setting aside its general poor taste, I use this ad in my statistics class as an archetypal example of the need to control for confounding variables (in this case soda consumption, which is positively associated with weight and negatively associated with milk consumption). According to the FTC's letter (.pdf), addressed to the PCRM's Neal Barnard, USDA promised "that any future advertising and marketing that discusses the role of dairy and weight management will be limited to messages that are consistent with the current USDA/HHS Guidelines." This is a major policy change. I have been following the tension between the checkoff advertising messages and the dietary guidelines closely for several years (see articles here and here and many posts in U.S. food policy), and have been surprised that USDA was not pressured to modify its checkoff campaigns sooner. Today's news may have implications for the future of the checkoff programs more broadly. If the federal government begins to require that checkoff campaigns be consistent with the Dietary Guidelines, the rank and file among commodity producers may begin to question more strongly the merit of administering their advertising through federal checkoff programs. For the checkoff programs, every campaign must be approved by USDA as "government speech," a requirement that a purely private sector advertising program would not have to meet. Last November, I posted about our effort to start using the car less. Our experiment has become a routine. We now use the car on about five days a month, and keep track of our "no car" days on a calendar. This new discipline was covered in an article by Nancy Shohet West in the Boston Globe regional edition (the print edition included photographs of my wife and kids biking around). Walking and biking during the unseasonably warm months of November and December went smoothly. A cold snap that began in late January forced Huber to become more resourceful. When she and Keziah left the house one morning last month for piano lessons, the thermometer registered 8 degrees. "Keziah had about four layers of clothing on, plus a snowsuit. I put her in the bike trailer and wrapped an outdoor sleeping bag around her. When we got to Lexington, she said she was toasty warm, and I was sweating from the exertion." Huber and Wilde expected that the car-free experiment would make them feel virtuous. What has surprised them is how much fun they are having. They find themselves linked to their community in a new way. "Since we're not driving, we are more likely to shop close to home. That means we support local businesses and see our neighbors more," Huber explained. "And biking or walking means we can stop and talk to people along the way. I was biking to Belmont last week, and I saw a woman I knew in college shoveling her driveway. I never even knew she lived there. If I'd been in the car, I wouldn't have even recognized her, let alone stopped to talk." Community building has happened in another way, too. Friends who know about the family's car-free experiment have gone out of their way to help. "If our neighbor is going to the grocery store, she asks if she can pick us up anything," Huber said. "In December, a friend invited me to go gift shopping with her. And of course we spend less money because we go to fewer stores. Last month Isaac needed a white shirt to wear for a concert. Normally I would have driven to Target. Since I didn't want to do that, I asked a friend with kids if we could borrow one." Wilde emphasized, though, that the experiment is not turning them into freeloaders; it works both ways. "On the rare days that we do use the car, we offer to do errands for other people," he said. "The point isn't to eliminate all cars; it's to cut down on everyone's fuel consumption." The experience leaves me totally convinced that we could live richly and comfortably with much less energy use, if we ever make a collective decision to do so. For many Americans who are poor, life is a long road of one tribulation after another. It is not just the difficulty of acquiring food. A low-income American must in addition struggle to find adequate housing, appropriate health care, and affordable transportation, let alone more ephemeral goods such as a safe neighborhood, equal rights before the law, and the fundamental decency and respect that every one of us deserves as a human being. Indeed, for many low-income Americans, access to enough food may not be the worst of that long list of tribulations. The real retail consumer price of food is lower in the contemporary United States than it is in other countries or at other times in our own history. The federal government serves low-income Americans with a national entitlement program for food, whereas there is no such national entitlement program for housing or other important and expensive basic needs. I appreciate the spirit of the recent much-publicized effort of Oregon Governor Ted Kulongoski to practice living on a tight budget, even as I must with a sigh quibble about the details. Kulongoski is trying to live on a food budget of $21 per week, which is described in an Associated Press article by Julia Silverman as "the same amount that the state's average food stamp recipient spends weekly on groceries." But the federal food stamp benefit is designed around a food budget of $155 monthly for a single person or $518 for a family of four. That is equivalent to $30 or $35 per week per person. Kulongoski's much lower figure comes from the average food stamp benefit. The food stamp benefit formula provides the highest benefit amount to those with the least cash income, and lower benefit amounts to those with more cash income, so nobody -- even in government -- expects anybody to be able to afford enough food on the average food stamp benefit. The average amount that recipients spend on groceries, and the average amount that the Food Stamp Program is designed to support in the participant's budget, are both higher. It's not an entirely harmless error. Some advocates for low-income Americans have been pushing hard for an increase in the food stamp benefit. But whose benefits should be increased? Should it be the destitute mother of three children, who currently has $518 monthly in food benefits but barely a dollar of cash income? Why doesn't somebody ask her whether she wants more food stamps or some other more general income support? Should it be the low-income working family or retiree, who currently lives at 130% of the poverty line? Certainly, such people don't get very generous food stamp benefits, but where is the progressivity in raising federal assistance for them without increasing cash income for the mother of three? As a publicity event based on a misdiagnosis of the tribulations that low-income Americans face, the Oregon governor's exercise provides an unnecessary target for heartless critics. And perhaps it provides a reassuring picture of an easy remedy -- more food -- when we really have a bigger challenge to face in renewing our commitment to addressing poverty and offering equal economic opportunities to all Americans. That agenda starts with education reform and funding (such as this initiative in Massachusetts and similar efforts at the federal level). But, even in the food stamp policy arena, several priorities precede an increase in the benefit amount for current participants: increased outreach, program simplification, continued reductions in the paperwork burden of participating, improving the program's effectiveness in influencing nutrition quality and reducing hunger, and -- if there is an increase in the maximum benefit -- increasing the flexibility for participants to spend those resources on all of their basic needs as they see fit.